The project is also setting its sights further ahead with preparation for the MEH phase (Mechanical, Electrical and HVAC – heating, ventilation and air conditioning). Today (Thursday) four major UK contractors signed the “MEH Alliance” to work together on the complex installation of cabling and pipework in the power station’s 2,500 rooms. 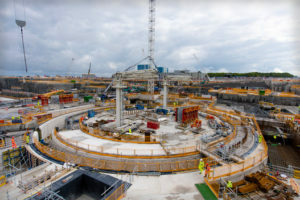 The innovative approach means that Altrad, Balfour Beatty Bailey, Cavendish Nuclear and Doosan Babcock will pool their expertise to work as a single entity. The alliance aims to create new industrial capacity and jobs by manufacturing specialist pipework in Britain. EDF Energy is the UK’s largest producer of low-carbon electricity, meeting around one-fifth of the country’s demand and supplying millions of customers and businesses with electricity and gas.It generates electricity with eight nuclear power stations, more than 30 wind farms, one gas and two coal power stations, as well as with combined heat and power plants.EDF Energy is leading the UK’s nuclear renaissance with the construction of a new nuclear power station at Hinkley Point C. This will provide low carbon electricity to meet 7% of UK demand. 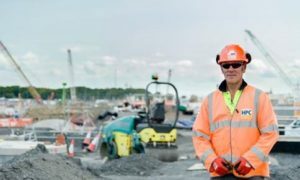 The project is already making a positive impact on the local and national economy, British industry, as well as boosting skills and education. EDF Energy also invests in a range of low carbon technologies including renewables and battery storage. It is applying research and development expertise to improve the performance of existing generation and developing the potential of new technologies.The company provides gas and electricity for more than 5 million customer accounts and is the biggest supplier of electricity by volume in Great Britain and the largest supplier to British businesses. It offers innovative energy systems for commercial customers and digital innovation for customers at home. EDF Energy has also launched its own innovation accelerator, Blue Lab, which focuses on making customers’ lives easier.The Better Plan is EDF Energy’s framework for being a sustainable and responsible energy business and is an integral part of EDF’s 2030 vision to be the efficient, responsible electricity company, and champion of low-carbon growth. The Better Plan is underpinned by comprehensive environmental and social programmes which have been recognised by a wide range of organisations.